In the 1930s and 1940s an artist named Paul Dubosclard maintained a print shop in Topanga, California. In the 1930s and 1940s an artist named Paul Dubosclard maintained a print shop in Topanga, California. There he created silkscreen images, which were usually in the form of sets of beautiful postcards. One of Dubosclard's many interests was the Zodiac. In this series of greeting cards originally a limited edition set the twelve signs are beautifully rendered in Dubosclard's signature palette of blues. The sign of each character, e.g. 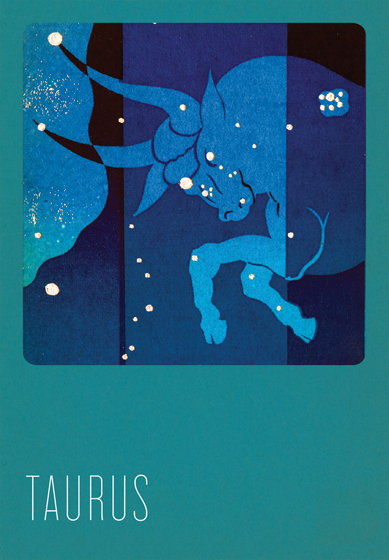 Ariesram, Capricorngoat, is overlaid with its constellation, in sparkling silver stars. The accompanying symbol, in contrasting red, adds yet another layer to these images. These cards were hand silk screened in Seattle, Washington. These cards are blank inside, making them suitable for both birthdays and other occasions. On the reverse is a brief note about the astrological sign depicted. The envelopes for these special cards are Pantone's Color of the Year for 2013 - Emerald! (17-5641).